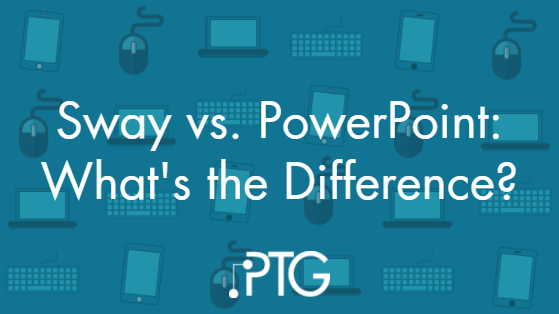 Sway vs. PowerPoint: What's the difference? 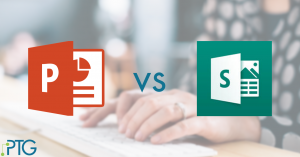 When we first wrote this comparison in 2015, Sway was a new app from Microsoft. It was fun and had its applications but was a little limited in scope. Since then, Microsoft has added a lot of new features, making this lesser known app a powerful tool for building interactive presentations. But the question remains – Why would you use Sway to make a presentation when PowerPoint already exists? What’s the difference? Powerpoint vs. Sway: What's the difference? Hey there! Microsoft has been adding new features to both Sway and PowerPoint since this blog was originally written. Read the new version of this blog post for the most up to date information. Recently, Microsoft introduced a new presentation building app called Sway (read our introductory blog post here or view our Sway about Sway here). An obvious first question is "why would Microsoft introduce a new presentation building app when they already have PowerPoint?" The answer – because not all presentations are created equal.